You are both gorgeous, and your selfies are good too. You are looking really nice and at home. A blog name? We will think on that. Tommy and Teaghan are adorable! Happy Father's Day! Thanks for coming by my blog. These kitties are just beautiful. They are so lucky to get their own blog when mom decides on a name. I like a regular blog. There is so much you can do. Otoh, blogger has some cool resources. Happy Fathers Day to you. These two guys are going to be so much fun, they both look like they are ready to have fantastic exploring adventures. How about Suited To a T? Or how about....I could go on forever. 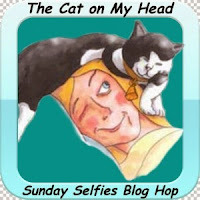 Nothing like kitten Sunday Selfies! They are so beautiful and we look forward to your photos of them. How cute, adorably mega epically supurr cute selfies!!! Thanks for the adorable share. Great seeing them two sharing a nice bowl of food together. They must really love each other. Our favorite photo is the one with Tommy with his tongue out. That's a great selfie right there. Have a great weekend.